The Best Bird blogs from thousands of top Bird blogs in our index using search and social metrics. Data will be refreshed once a week. Also check out Bird Podcasts and Bird Youtube Channels list for Top videos on Bird. 2.34 Animal Perspectives - All Things Environment, Nature, & Bird. Bird newsletter is a comprehensive summary of the day's most important blog posts and news articles from the best Bird websites on the web, and delivered to your email inbox each morning. To subscribe, simply provide us with your email address. U.S. About Blog Audubon’s mission is to conserve and restore natural ecosystems, focusing on birds, other wildlife, and their habitats for the benefit of humanity and the earth's biological diversity. Facebook fans 1,177,984. Twitter followers 133,549. Sapsucker Woods, Ithaca, NY About Blog The Cornell Lab of Ornithology is a world leader in the study and conservation of birds. Its mission is to interpret and conserve the earth's biological diversity through research, education, and citizen science focused on birds. Facebook fans 716,833. Twitter followers 41,344. Cambridge, UK About Blog BirdLife International is the world's largest nature conservation network, with 122 Partners in 120 countries. It is widely recognised as the world leader in bird conservation. Its mission is to conserve birds, their habitats and global biodiversity, working with people towards sustainability in the use of natural resources. Facebook fans 323,837. Twitter followers 69,773. Worldwide About Blog Surfbirds Blogs is a free weblog community of online birding diaries and journals. They are a group of birding friends from Britain and America who decided to team up on an international birding website. Facebook fans 12,066. Twitter followers 6,954. Braintree, Massachusetts USA About Blog A bimonthly US magazine about wild birds, birdwatching, and bird photography. Its mission is to help readers enjoy birdwatching as much as by making them better birdwatchers. Facebook fans 26,298. Twitter followers 25,806. Worldwide About Blog Welcome to 10,000 Birds, just the place for people who love birds, pictures of birds, and people who write about birds, birding, conservation, and much more. Facebook fans 18,350. Twitter followers 2,638. Washington, DC About Blog American Bird Conservancy is a not-for-profit organization whose mission is to conserve native wild birds and their habitats throughout the Americas. Watch videos on Youtube. Facebook fans 726,448. Twitter followers 18,201. Delaware City, DE About Blog American Birding Association (ABA) provides a community, forum, and resources for every birder, bird watcher, and bird enthusiast. Facebook fans 19,146. Twitter followers 15,100. Thetford, Norfolk, UK About Blog The British Trust for Ornithology (BTO) is the UK's leading charity working with volunteers to improve our knowledge of birds through monitoring and research. Its mission is to deliver objective information and advice, through undertaking impartial research and analysis, about birds, other species and habitats, to advance understanding of nature. Facebook fans 24,939. Twitter followers 81,887. Seattle, WA About Blog BirdNote is a radio show that combines rich sounds with engaging stories, to illustrate the amazing lives of birds and give you a momentary respite from the news of the day. Facebook fans 29,414. Twitter followers 6,656. California About Blog News and Views from International Bird Rescue. International Bird Rescue (Bird Rescue) has been saving seabirds and other aquatic birds around the world. Its mission is to mitigate human impact on aquatic birds and other wildlife. This is achieved through rehabilitation, emergency response, education, research, planning and training. Facebook fans 81,616. Twitter followers 12,594. Sapsucker Woods, Ithaca, NY About Blog Count Feeder Birds for ScienceProject FeederWatch is operated by the Cornell Lab of Ornithology and Bird Studies Canada. Its mission is to bring the public and scientists together in a partnership that helps us all learn more about birds and the natural world. Facebook fans 287,703. Twitter followers 2,293. San Francisco, CA About Blog Get all the news updates on birding, birdwatching etc. Facebook fans 1,169,264. Twitter followers 527,550. New Zealand About Blog Forest & Bird is New Zealand’s leading independent (not-for-profit) conservation organisation. We work to protect, restore and defend New Zealand's wildlife and wild places. Originally formed to protect our native forests and birds, our role has since grown to include all of New Zealand's wildlife and wild places – on land and in our oceans, lakes and rivers. Facebook fans 106,357. Twitter followers 11,350. United Kingdom About Blog British Birds is a monthly journal for all keen birdwatchers. We publish articles on a wide variety of topics, including behaviour, conservation, distribution, identification, status and taxonomy. Facebook fans n/a. Twitter followers 37,998. Songbird Lane Chico, CA About Blog Accurate and complete information about wild birds from a professional ornithologist. Pittsburgh, PA About Blog A Bird Blog with Kate St. John. Blogging about birds, nature and peregrine falcons since 2007. Worldwide About Blog A real-time, online checklist program, eBird has revolutionized the way that the birding community reports and accesses information about birds. eBird’s goal is to maximize the utility and accessibility of the vast numbers of bird observations made each year by recreational and professional bird watchers. Facebook fans 61,722. Twitter followers 17,378. Calgary, Alberta, Canada About Blog A birding blog for Calgary, Alberta and area. Facebook fans n/a. Twitter followers 1,103. Duluth, MN About Blog For the love, understanding, and protection of birds by Laura's Birding Blog. Facebook fans n/a. Twitter followers 181. Facebook fans 6,383. Twitter followers 476. Cornwall, UK About Blog This blog provides information about birds in Cornwall. This blog includes superb Galleries, recent sightings, site guides and much more. Facebook fans 1,090. Twitter followers 3,135. Minneapolis, MN About Blog An interest in the ecology of birds will probably lead you to this site, which features full-color images and information about birds. Sharon Stiteler, the Birdchick, talks about the latest in birding news. Facebook fans 5,949. Twitter followers 8,299. Costa Rica About Blog Information and perspectives about birding in Costa Rica.After several visits to Costa Rica since 1992, I am practicing birding. Follow my blog to know more about living and birding in Costa Rica. Facebook fans 1,598. Twitter followers 393. Northfield, Minnesota About Blog This blog is devoted to birds, dragonflies and natural history centered on, but not limited to, Northfield, Minnesota. Bangladesh About Blog The spoon-billed sandpiper Calidris pygmaea is one of the most threatened birds on the planet. The ultimate goal of spoon-billed sandpiper conservation is a secure future for the species. Tarifa, Spain About Blog We offer birding and photography guided tours in the Strait of Gibraltar, Andalusia and Morocco, a region with outstanding scenery and biodiversity. Facebook fans 2,732. Twitter followers 2,371. UK About Blog The BBRC is the official adjudicator of rare bird records in Britain. It publishes its annual report in the monthly journal British Birds. These web pages supplement the Annual Report and also enable birders worldwide to keep abreast with the latest committee news. Facebook fans n/a. Twitter followers 5,031. Woldwide About Blog The official blog of ornithology journals The Auk and The Condor. Facebook fans n/a. Twitter followers 5,696. New Hampshire, United States About Blog Lillian and Don Stokes Blog by Lillian Stokes since 2006. United States About Blog Celebrating Michigan Birds, Birding / Digiscoping and Photography. Republic of Korea About Blog Birds Korea is dedicated to the conservation of birds and their habitats in Korea and the Yellow Sea. Based in Busan in the Republic of Korea, the organisation has a strong international outreach, working through regional advisors and a global network. Facebook fans 1,147. Twitter followers 645. 34. Animal Perspectives - All Things Environment, Nature, & Bird. Maryland About Blog AnimalPerspectives.Com is a website that I created with the intention to provide reliable information about wildlife — nature is for everyone! Animal Perspectives currently focuses birds and ornithology (the study of birds). My mission is to provide information about the environment, wild birds, and nature in the United States. Facebook fans 279. Twitter followers 296. Hackbridge, Surrey About Blog This is my birding and nature blog/profile mostly about my local patch Beddington Farmlands which is being developed into a nature reserve within the Wandle Valley Regional Park in South London. Facebook fans n/a. Twitter followers 398. About Blog Bird Baths for Sale site provides information and resources to help you decide which bird bath to buy. Facebook fans 185. Twitter followers n/a. Pembrokeshire About Blog Pembrokeshire Birds is the internet service for birders in Pembrokeshire to share sightings. The blog currently receives around a thousand hits a day and Pembrokeshire Birds is regularly monitored for sightings by the national bird news services. Facebook fans n/a. Twitter followers 475. Facebook fans 38,083. Twitter followers 69. Newfoundland, Canada About Blog Welcome to my channel. Every video that I upload is purely for entertainment, with that said, though I do as well try my hardest to pass along any educative, or as accurate information that I know of through each video that I create. Birds, wildlife, and nature in general is something I'm truly passionate about. Facebook fans 12,120. Twitter followers 2,530. Bogota, Colombia About Blog The Colombian Birds are excellent flagships and vital environmental indicators for your conservation. Watch videos on Youtube. Facebook fans n/a. Twitter followers 1,976. Belfast About Blog This site is run by a voluntary group of birders documenting and recording information about the birds and wildlife of Northern Ireland. We provide information on rarities and interesting sightings. About Blog Blog about Bird Watching, Bird Ringing and Photography. BC, Canada About Blog The BC Rare Bird Alert covers all regions of British Columbia, Canada. It serves to provide current information on rare and noteworthy bird sightings in the province. Facebook fans n/a. Twitter followers 581. Oslo, Norway About Blog Oslo Birder is a blog by Simon Rix that features the sightings and occasional thoughts of an English birder in Oslo, Norway. Rio Grande Valley, Texas About Blog Birding in the Rio Grande Valley and sometimes elsewhere. Connecticut, United States About Blog A Connecticut native with an interest in birding shares his outdoor adventures. About Blog Blogging for too long, birding even longer. Portland Bill, Dorset, England About Blog We are an independent organisation and a UK registered charity. We cater not just for birders but for naturalists of all persuasions, and our accommodation in the Old Lower Lighthouse is available to anyone who wishes to stay with us and enjoy any aspect of the natural environment of Portland. Facebook fans n/a. Twitter followers 6,170. About Blog Hi! We are Miles & Teresa Tuffli. We love learning about birds and bird vocalizations, particularly in Sonoma County, California, where we are lucky to live. We enjoy volunteering our time with nature-based organizations within our community. About Blog I'm Findlay Wilde; a conservationist fascinated by all wildlife, but especially birds. Facebook fans n/a. Twitter followers 5,590. Bardsey Island, Gwynedd About Blog The latest news from Bardsey Bird and Field Observatory. Bardsey Bird Observatory is one of two fully accredited observatories in Wales and is one of a growing network of bird observatories in the British Isles. Facebook fans 824. Twitter followers 5,000. New Jersey, USA About Blog Blog about birding, wildlife, and the environment conservation from the nation's capital. Facebook fans n/a. Twitter followers 4,127. About Blog Enjoy Birding & Nature Watching on Robs Birding Blog. Facebook fans n/a. Twitter followers 3,312. London About Blog 25-year-old wildlife, photography, sport and electronic music enthusiast. BirdGuides news manager. Views are my own. Facebook fans n/a. Twitter followers 2,099. Staffordshire About Blog Welcome to Staffordshire Birding. This blog will be updated with Staffordshire bird news on a daily basis. This site will contain bird news only, no discussions, questions or threads. Facebook fans n/a. Twitter followers 1,908. Birkenhead, Cheshire About Blog I’m Elliot Pierre Montieth and welcome to my blog “Elliot’s Birding Diaries” which has been on show for its 3rd year running. I myself am a 18 year old Birder, Surveyor, Wildlife Photographer, Geologist and occasional Twitcher based on the Wirral peninsular in the north west county of Cheshire. Facebook fans n/a. Twitter followers 1,679. Hilbre Islands, England About Blog Get latest news from Bird Observatory on Hilbre Islands established in 1957, run by volunteers and accredited to BOC in 2008. Facebook fans n/a. Twitter followers 1,737. London About Blog Bird Sightings and wildlife news from the Regent's, Bushy and several other Royal Parks as well as news from my trips away from London. Facebook fans n/a. Twitter followers 1,577. Muraviovka Park, East Russia About Blog Bird and Conservation News from Muraviovka Park and Amur region. Facebook fans 1,312. Twitter followers 475. Dorset About Blog Dorset Birds mission is to promote the interest of birds and birdwatching in Dorset & collate bird records, producing the annual Dorset Bird Report. Facebook fans n/a. Twitter followers 1,457. Florida About Blog Backyard Birder shares original photos and videos of Nature with an emphasis on Birds, especially Owls. The everyday wonder of Nature and the unique moments when creatures interact or reveal unusual behavior. Facebook fans 359. Twitter followers 517. UK About Blog This page is dedicated to the birds and wildlife of the Isle of Islay. Islay is a beautiful and fertile Island and hosts a fantastic and varied population of birds and wildlife, due to the varied habitat, large wild areas and generally mild climate it is home to many species that are scarce across the rest of the UK. Facebook fans 799. Twitter followers n/a. About Blog Backyard Birdlady online store & blog featuring the Birdie Bungalow coat rack & cubbie, birdhouses, Oriole feeders, and more. Made with love in North Tonawanda NY USA. Follow this blog to learn about the birds & wildlife that visit our yard. Facebook fans 102. Twitter followers 37. Lincolnshire, United Kingdom About Blog Get birding updates on The Wryneck. Montgomeryshire About Blog Bird news from Montgomeryshire, Wales. Facebook fans n/a. Twitter followers 378. About Blog Get birding updates on Oxon Birding Blog. About Blog Ring Watching At Antrim Marina & Rings Spotted Elsewhere. About Blog A blog about Birding and Bird watching. A twitcher's blog. Twitching, Birdwatching, Beautiful Birds. Norfolk About Blog Wildlife of the Yare Valley and the countryside around Blofield Heath. I've been looking at birds for fifty years: I used to twitch, but stopped when I'd seen 400 UK species. Lundy, England About Blog Recent bird sightings and news on Lundy Birds blog. West Sussex, United Kingdom About Blog Get latest updates on birding. About Blog As a bird biologist and behavioural ecologist, Glen Chilton has the finest job in all the world. His brain is being tickled all the time as he travel to exotic locales in the name of research. About Blog Birds and nature in Japan and Australia. About Blog There are about 10,000 species of birds currently found on Earth. One species that has drawn a disproportionate share of humans’ attention is the California condor. Cape May, NJ USA About Blog This blog is about sharing the joy found in birds and life. Especially birds, birders and birding in Cape May, NJ, where I happen to live. Facebook fans n/a. Twitter followers 704. About Blog I am from India and am 16 years old. My name is Aditya Singh. I am deeply interested in birds, wildlife and nature and want to do my bit in conserving our bio-diversity. Whenever it is possible, I do make it a point to visit places where I can observe birds and wildlife and take some pictures. Chicago About Blog Jeff Reiter's newspaper column about birds, birding and birders, appearing in the Daily Herald (west suburban Chicago). Carmarthenshire, Wales About Blog The Carmarthenshire Bird Club exists to promote the observation, study, recording and protection of the wild birds and wild-bird populations of Carmarthenshire. Facebook fans n/a. Twitter followers 94. Hong Kong About Blog Mainly birding in Hong Kong with a few pictures thrown in. About - BirdLife International is the world’s largest nature conservation network, with 122 Partners in 120 countries. It is widely recognised as the world leader in bird conservation. Its mission is to conserve birds, their habitats and global biodiversity, working with people towards sustainability in the use of natural resources. About - British Birds is a monthly journal for all keen birdwatchers. We publish articles on a wide variety of topics, including behaviour, conservation, distribution, identification, status and taxonomy. About - This blog provides information about birds in Cornwall. This blog includes superb Galleries, recent sightings, site guides and much more. About - Bird Watching, Bird Ringing, Photography. CONGRATULATIONS to every blogger that has made this Top Bird Blogs list! 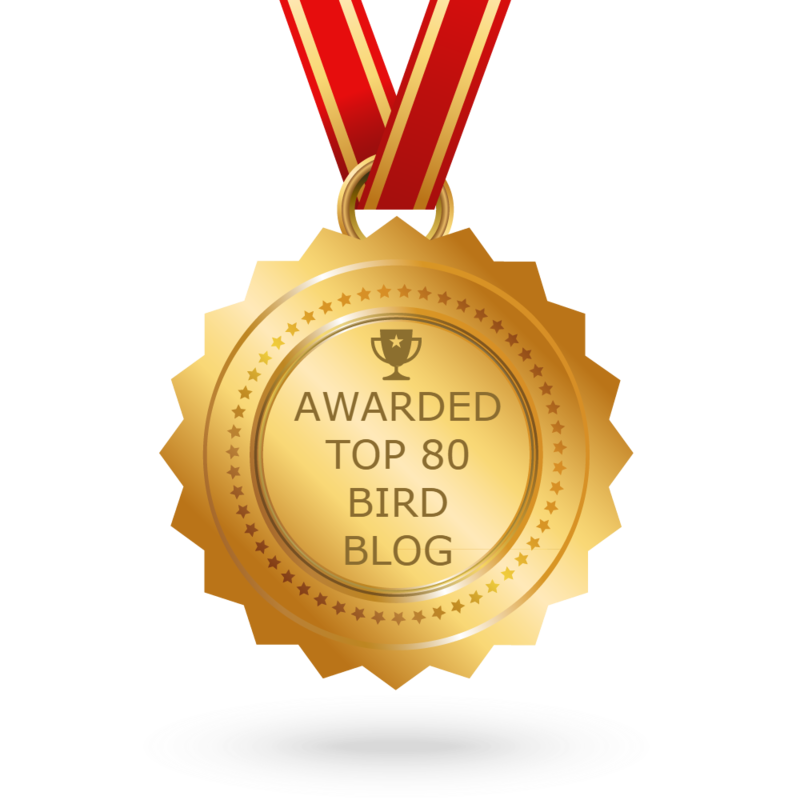 This is the most comprehensive list of best Bird blogs on the internet and I’m honoured to have you as part of this! I personally give you a high-five and want to thank you for your contribution to this world.